Average credit card rates offered to consumers for new accounts rose to 16.86 percent in the last two weeks, according the latest IndexCreditCards.com survey. The average overall consumer rate broke the previous record of 16.85 percent set in June 2010--the highest level since the site began tracking rates in 2005. The record rates are due to increases both in reward and non-reward consumer credit cards. The reward credit card rate rose to 17.55 percent from the previous survey's 17.43 percent, and the non-reward credit card rate rose to 15.25 percent from 15.15 percent. Reward credit cards generally feature higher rates than non-reward credit cards; the higher finance charges pay for the reward programs. Average rates for student and business credit cards remained the same in the last two weeks. One year ago, average consumer credit rates broke the 16 percent barrier for the first time, rising to 16.36 percent. The average non-reward credit card rate for consumers was 14.67 percent, and the average reward credit card rate was 17.09 percent. The jump to more than 16 percent followed several months of rate hikes by credit card issuers as they braced for new federal regulations that would severely limit their ability to raise rates on existing accounts. Those rules went into effect in February of this year. Since then credit card rates have bounced up and down, gaining more stability in the last several months. 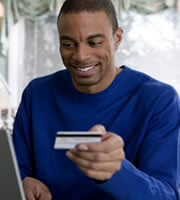 Since June 2010, the average consumer credit card rate has ranged from 16.74 percent to 16.85 percent. Business card rates have risen faster in the last year than student or consumer credit card rates, although they remained stable in the last two weeks. Just one year ago, the average business non-reward credit card rate was just 13.39 percent--more than a full percentage point under the current 14.72 percent. The average business reward credit card rate was 14.53 percent, more than 1.5 percentage points less than the current average of 16.21 percent. Business credit cards are not covered under the federal Credit CARD Act, which among other things prohibits issuers from raising rates on existing balances unless cardholders are more than 60 days late on payments. Some issuers have voluntarily extended such consumer protections to their business card holders, although they're under no legal obligation to do so. Rising credit card rates put business owners in a tough spot. With declining commercial property values and tough economic conditions, small-business owners have a hard time meeting qualifications for conventional business loans, so many entrepreneurs resort to credit cards to finance capital and meet cash flow challenges. Student credit card rates have risen in the last year to 16.23 percent from 15.91 percent. Students under 21 must now get adult cosigners unless they can prove they have sufficient income to pay their credit card bills, and issuers are prohibited from marketing credit cards to college students on campus. Whether these changes have led to the rate increases for student cards is hard to say. To determine average credit card rates for the various categories of cards, the IndexCreditCards.com survey takes into account all the various rate tiers. Most credit cards charge two to four different rates based on credit histories. Applicants with the best credit history get offered the lowest rates, while those with poor credit are assigned the highest rates. 0 Responses to "Average consumer credit card rate hits a record high"